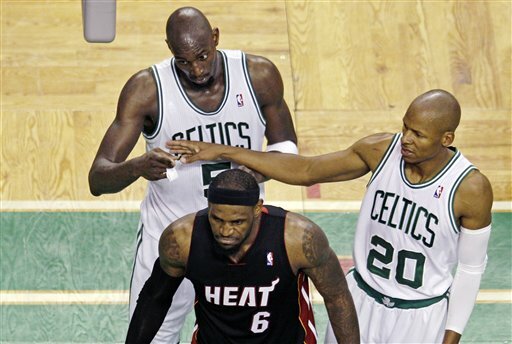 A person familiar with the schedule says free agent guard Ray Allen – who the Boston Celtics hope to re-sign – will visit with LeBron James and the NBA champion Miami Heat on Thursday. MIAMI — The NBA champion Miami Heat will get to make their sales pitch to Ray Allen. A person familiar with Allen’s plans told The Associated Press that the free-agent shooting guard will visit with Heat officials Thursday. Allen also is scheduled to visit Friday with the Los Angeles Clippers, according to the person who spoke on condition of anonymity because the plans were not announced. Allen would figure to be a perfect fit with Miami because the Heat want to surround James, Dwyane Wade and Chris Bosh with shooters who extend defenses and therefore create room around the basket for the “Big Three” to attack. That approach worked perfectly for Miami in the playoffs — the Heat were 9-1 when making at least eight 3-pointers in playoff games (7-6 otherwise), and they hit 14 in the finals-clincher over Oklahoma City. Allen has made at least 100 3-pointers in 15 of his 16 seasons, the lone exception being when he connected on 74 in the shortened 50-game schedule of 1998-99. He’s established career-bests for accuracy in each of the past two seasons, first making 44 percent of his 3’s in 2010-11, then 45 percent this past year. His 2,718 career 3-pointers are the most in NBA history. The selling point that summer was “sacrifice,” and that hasn’t changed. That’s about all Miami can offer anyone this summer as well. Barring any trades, the biggest chip Riley has to dangle is the mini mid-level.